Yes, you read that right...Tate Prescott, The Tate Prescott, Hollywood Superstar and now the most sought after movie director in the industry is mine. We’ve hidden our relationship from the world for so long that it’s become second nature. The last thing we wanted was a media frenzy to rain down on us. 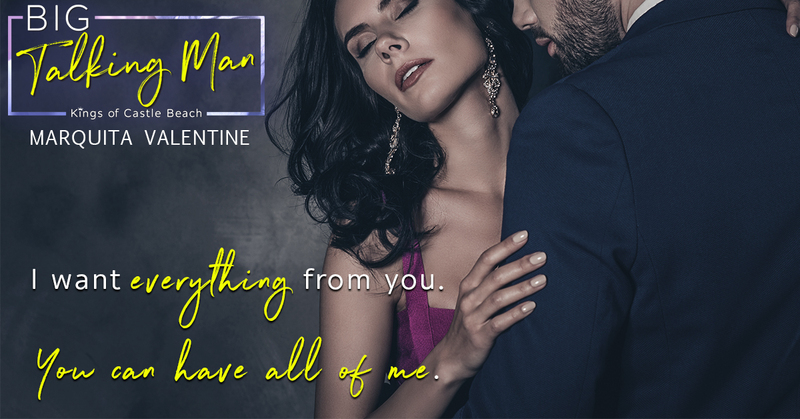 Big Talking Man is book 2 in the Kings of Castle Beach series by Marquita, but can be read as a standalone. My opinion is that you should read book 1 first or you will be a bit lost with the characters. If you've read the first book then you'll have already met Quinn and the rest of her family and got to know them all a bit which helps when reading this book. The reason for my in the middle rating was the fact that I didn't massively connect to Quinn. Tate I loved, he made this book for me but Quinn I found annoying at times aswell as not connecting to her which kind of made it hard to invest in these to as a couple. For her age I felt that she needed to grow up and stop acting like the teenager she isn't, she was so immature to the point of been really very annoying. For the first time ever I actually didn't want them to be together as I just didnt believe in them as a couple and yet I just completly adored Tate. It was a really mixed book for me as you can see. While I didn't love Quinn I did enjoy the book and the storyline and of course I loved Tate. I will definatly be reading more as I did love the first book in this series I just think I had a bit of a personality clash with Quinn which knocked this book for me.